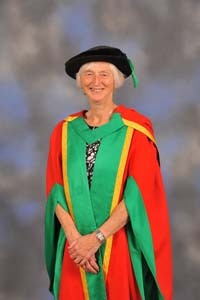 Honorary Degree of Doctor of Science in recognition of her significant contribution to sport performance at national and Olympic level, in particular to Great Britain’s 2012 Olympic success and, just as importantly, to enhancing the quantity and quality of sporting opportunities and to reducing inequalities in sporting provision for young people across the United Kingdom. Appointed MBE in 1991, awarded a CBE in 2003 and created Baroness Campbell of Loughborough in 2008, Sue Campbell has been named as one of the top 100 most powerful women in any field in the UK. Sue Campbell grew up in Chilwell, not far from Nottingham Trent University’s Clifton Campus. She had lived, studied and worked in much of the East Midlands before being appointed Regional Officer at the Sports Council of Great Britain in 1980. Subsequently Sue became Chief Executive of the National Coaching Foundation from 1985-1995 and introduced a university validated degree targeted at coaches. In 1995, she became Chief Executive of the Youth Sport Trust, ensuring, through a rigorous research, evaluation and outreach programme, that all young people had the opportunity to take part in physical education and sport regardless of gender, ethnicity, socio-economic status and geographical location. 29 golds and 65 medals at London 2012. She has recently taken on the challenge of the role of ‘Head of Women’s Football’ working within the Football Association.